Friday Fun Facts – Time Management cS Style! As a small business startup we spend a great deal of time looking at and analyzing data to help us drive strategy, make adjustments, and better understand our customers. We try hard to not be robotic in our response to numbers, but rather to let them inform our decisions and our direction and we believe that this is how all small businesses should use their own. Here is the fourth in what will be a serial discussion of some of the data we look at internally, the numbers we analyze, and our strategic approach. Last week we discussed using crowdSPRING’s project data to help you creatives decide which projects you might choose to work on. This week we’re gonna offer up some suggestions and strategies for determining WHEN to work. I know that you guys are scattered around the world’s time zones, and I know that you each have your own scheduling imperatives. Maybe you have a full-time job outside of cS. Maybe you work nights. Maybe the new baby keeps waking you at 2am (your time, that is). In any case it is clear that there are some interesting patterns that have developed on cS which you may be able to leverage to your own benefit. In my observation, most of you seem to subscribe to one of two basic schools of thought. There are the “early birds,” those of you who like to jump into a new project almost as soon as it is posted. This might allow you to develop an early (and valuable) dialog with the buyer, build a relationship quickly, and iterate based on the feedback you get. Then there are the “birds of prey.” These are creatives who prefer to hang back and watch. They may pick projects based strictly on the quantity and quality of a buyers feedback. These designers will comb through the projects looking for a buyer who is clearly communicating their needs. Once they see a good one, they swoop in towards the end hoping to provide what the buyer is looking for. So, you ask? What does this mean to me, you ask? Well, I’ll tell you what I have learned by taking a hard look at when projects post and when they close. Let’s say you only want to work on crowdSPRING 2 days a week. Well, if you are an Early Bird, you probably want to work in the middle of the week. 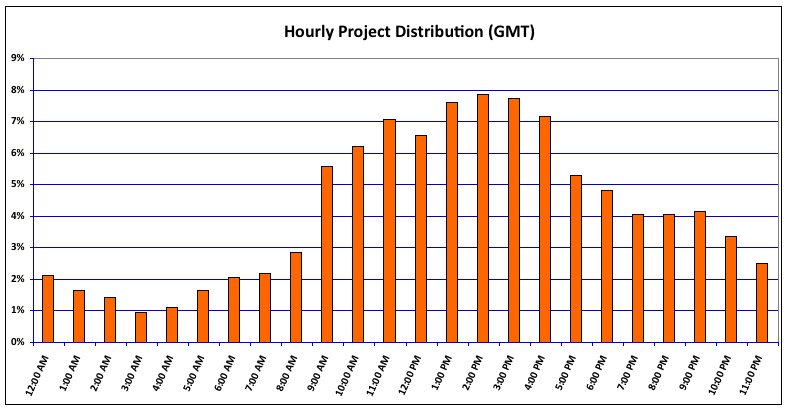 The first chart shows that 36% of all new projects are posted on Tuesday-Wednesday. If you are a Bird of Prey, you’ll be focused on the beginning of the week. The second chart (Project Closings) tells you that 33% of all projects close on Monday-Tuesday. In other words, no matter which group you fall into, by working just 2 days a week, you can cover 1/3 of all the projects on the site. Not bad, huh? Considering that we have been averaging over 150 open projects, that means you could have 50 to choose from on any given day. So, that’s it. I hope that this helps you to figure out the best days and times to do your thing, creatives. In the meantime, Ross and I will continue our own personal time management strategy. It’s simple, really. Work 7 days a week, 20 hours a day, and make sure the other guy will stay awake while you fall into bed for a few hours…. Guest post by Index Time Clock.